All aboard the poker train, next stop, sunny Walsall as we headed to the West Midlands for the latest stop on the European poker circuit. Ranking points are becoming increasingly important as we fast approach the conclusion of 2005. Many players are in with a shout of the coveted first position in the rankings and the £10,000 added prize money that goes with it courtesy of williamhillpoker.com. This meant strong fields for every event as those in contention came from all over Europe to battle it out for the points and of course the money on offer. In attendance, amongst many others were Dave Colclough, John Falconer, Mickey Wernick, Bambos, Robert Binelli, Keith Hawkins, Julian Thew and even flamboyant Frenchman, Pascal Perrault managed to locate Walsall on the map. Event 1 was a £100 PLH re-buy event, which was won by Stephen Wilsdon, whose victory was all the more remarkable as he went back to the second day as the lowest chip stack but over turned this disadvantage, rode his luck and following some excellent play in the final eventually emerged as the winner of a cool £13,400. 2nd place went to T Emfalla with Pascal Perrault managing a handy 3rd place, which put him to the top of the rankings - albeit temporarily. Event 2 was the most popular event of the week with 163 hopefuls handing over £300 of their hard earned to take part in this affordable and well structured freeze-out event. Julian Thew took first prize with a performance to behold. Julian was chip leader at the start of the second day and just steadily built chips until he made the final where he absolutely dominated the table. Julian plays his own brand of mixed up aggressive poker and just doesn't let you breathe for a moment. He had his fair share of the cards but played exceptionally well busting out 5 players in a row to take an almost unassailable chip lead to the heads up stage where he defeated fellow rankings contender Mickey Wernick. Julian took home £18,500 for his win, Mickey had to settle for £9700, however this second place finish put Mickey top of the rankings just ahead of Pascal who had only been there for a day. As the atmosphere began to hot up and the buy-ins increased there was no time to relax before the commencement of event 3, which was another freeze-out - the £500 NLHE. 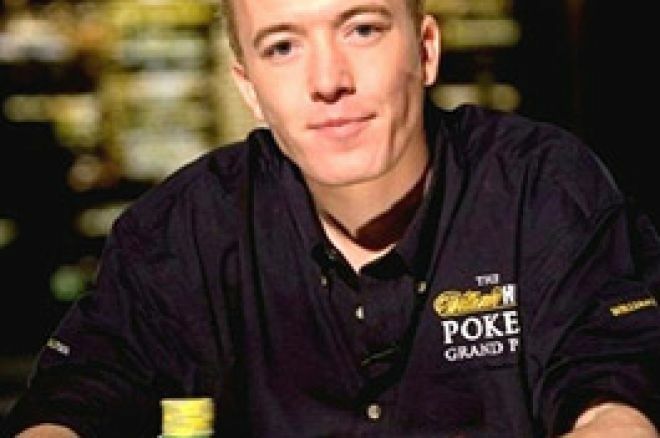 Although the event was won by Italian Londoner Robert Binelli, who moved himself into the European top 10 and earned himself £ 22,500 this event was all about 20yr old law student turned cyber geek and wonder kid James Atkin - he makes the milky bar kid look like the 'Werthers Original' granddad. James has only been playing for about 6 months on-line and this was only his second live event but he won a lot of admirers with his style of play and performance and managed 3rd place just behind Joseph Koumi who finished in 2nd for £11,500. Event 4 - The £750 NLHE, which attracted exactly 100 runners, was again all about wonder boy James Atkin. He managed to work his way into a big chip lead early on and kept building his stack and outplaying his opponents but he eventually came unstuck but still managed a very commendable and profitable 3rd place behind Davey Knight and local D Sami who agreed a 50:50 split of the prize money, taking home £ 22,500 each but played on for the trophy, which went to Davey after a very short heads up battle. Friday night was a little less frantic as only 70 players turned up for the £200 pot limit Omaha competition, which was won by A Korosh for £8680 , with Charlie Tsolikades and Joe Grech coming in 2nd and 3rd respectively. The one everyone wants to play in and the one everyone wants to win is undoubtedly the main event. This was no exception here at Walsall as 110 players battled it out over 2 very full days for the £66,000 first prize. The event was fantastically structured - it was a double chance freeze-out format, which means you get half of your chips at the start of the event and the other half either when you lose the first lot or at the end of the 2nd level. 15,000 in starting chips were given to each player and the blind levels were set at a fantastic 60 minutes. This all meant there were no excuses as everyone was given plenty of time to play, be patient and mix it up - more of the same please tournament directors! The first days play finished at 3am Sunday morning and 34 players returned for the second days play at 3pm. With 1.6 million chips in play and still plenty of time to wait and be patient we were in for a long haul. Eventually a final table of nine players was reached at around 10:30pm and the weary looking finalists racked up their chips and headed for the TV table complete with hole-card cameras, interviews and bright lights - a bit swish for Walsall but welcome to the poker-age ladies and gentlemen. It was 3am before we were down to the final 3 players after big chip leader throughout the day - Anthony Nicholls finished fourth. The final three comprised of Internet qualifier Paul Traynor (a slimmer and smaller version of Andy Black), Hendon Mobster Barney Boatman and local Walsall player Darren Grosvenor. Paul's efforts were rewarded with a more than commendable third place finish and his best ever live result. Darren eventually emerged victorious with a cheque for £66,000 leaving Barney to console himself with the fact he would be taking £34,600 back to North London for his second place efforts. As always the week was very enjoyable, well run and was made all the more enjoyable by the friendly and accommodating staff at Grosvenor Casino Walsall. Next stop for the poker train on the European circuit is Nova Gorica in Slovenia, where I am sure the regular ranking points hunters will be again on show trying to cement their places at the upper end of the ranking table. - All aboard! Ed note: You could be playing the best players in Europe at Euro Poker and earn yourself a $100 bonus.